This curious headdress of unknown origin was bought on a small street mart in Jakarta. The seller knew only that it comes from Sumatra, but I have not been able to find traces of this helmet in traditional costumes of the numerous peoples of the island. The helmet is interesting primarily in that it is made from the long hair of an animal, probably a horse, by weaving a thin and strong mesh. The free ends of the threads are fixed in the mesh and wrapped upwards giving the helmet a finished appearance. It is because of its strength and warlike appearance that the hat resembles a military helmet. 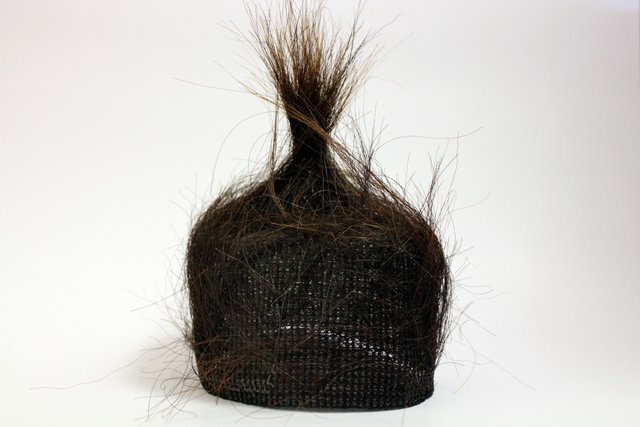 It is known that horsehair is used for decorating hats of the Batak, one of the most interesting people of Sumatra.